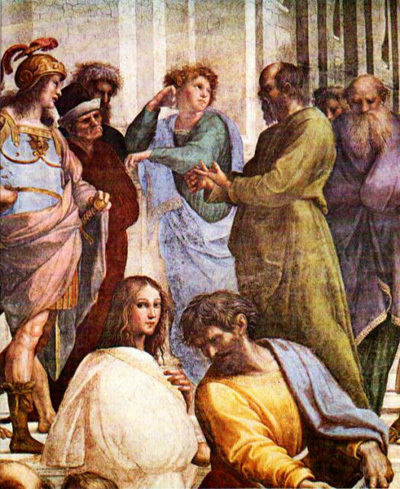 From Raphael's "The School of Athens"
This is part two of the three on testers helping testers. The three suggestions and workshops cover similar territory, but they have a unique enough level of difference that they can be handled individually. As I mentioned yesterday, testers are a genuinely helpful lot. I've spent hours debating cool topics with a variety of testers, and they have genuinely been psyched to participate. I find that it's good to be challenged, and see if our thinking and reasoning is sound. I've had some zingers thrown at me over the past few years from a variety of dedicate veteran testers. Some I've done well with, others have left me frustrated, all have taught me immensely. Workshop #73: Turn the tables and become the "debater" in a "Tester's Symposium". Challenge the speaker, ask them to clarify their thinking, debate their points and look for logical fallacies, potential traps and other ways that might lead to different ways of thinking about the problem. Look for opportunities to clarify your own thinking in the process. For those familiar with the writings of Plato, the idea of a Symposium with Socrates sitting in the center of the room and addressing the various attendees is a classic setup of what will likely be a very entertaining evening. Socrates is going to have a great time. The musicians, dancers, and food attendants will likewise have a great and entertaining evening. Those who are the guests of the Symposium might walk away wondering where their world view disappeared and when! Socrates was a master at getting people to examine their understanding of the world. He would ask a variety of questions get the person he was debating to clarify or show their thinking process. Often the end result was that Socrates would turn their world upside down, show them a number of logical fallacies that they were using, and demonstrate that, while they might not be incorrect, that their reasoning powers could use a bit of work. As the veteran tester, we would like to see ourselves in the role of Socrates… and that might be the first and biggest trap we step into. Rather, approach the discussion as though you were a group of peers (which in most cases will indeed be the case). As the one debating the "less experienced" person, your goal is to not tell them they are wrong, but to coach and guide them through discovering additional insights (and perhaps learna few new insights of your own). 1. As the coach or debater, get them to clearly and articulate the dilemma or question that they have. Try to help them couch their question or inquiry in specific terms. "I am having trouble with combinatorial testing" would be too open a topic. "When and where would pairwise testing be good enough, but n-tuple testing would make more sense?" is specific enough for an exploration that wouldn't be so specific that only exports would be able to answer and participate. The goal is to open debate and consider avenues. Too precise and the potential for learning could be stifled. 2. Ask the participant to work through some scenarios with you. Turn the tables and ask them questions as though you were now the person with the question. The idea is to see what the less experienced tester already understands or thinks they understand. This is your chance to see if they are, inductively, using weak or strong arguments, or if they are looking at things deductively, if they have a sound or unsound understanding and conclusions. 3. Help guide the less experienced tester through potential fallacies in logic, but be careful that you don't substitute your own in the process. Back to my comment about assuming the role of Socrates, we can cause more confusion if we are not careful, because we can just be substituting the less experienced tester's favorite fallacies and traps with our own. If you are not sure about your logic or reasoning, openly say that. There's no shame in a debate to say "you know, that's an interesting thought. I'm not sure that I am working with a sound premise… but let's go ask my friend over here". This opens the discussion, and also put you in the place of considering if your thinking is sound. Often, a less experienced tester can open our own minds to new avenues that we hadn't considered. 4. Ask clarifying questions, explore avenues the less experienced tester hadn't considered, and always try to keep the conversation collegial and fun. These can become contentious, and sometimes feelings can be hurt or people can get obsessed with defending their world view. As the "debater and facilitator" be prepared for this. Look for body language that shows frustration or defensiveness, and seek to quietly diffuse it. These discussions are not meant to look for a right way or to expose wrong ways. Instead, it's meant to help people see what logical fallacies they may fall prey to, and help them see them, as well as see them in ourselves. Just as we have the potential to help others see different ways to approach a problem or understand how they think, we likewise can be taught a few things by a less experienced tester. They can help bring things to our attention that we hadn't considered, and in ways that we would have dismissed because we have "been there and done that". Learning how to recognize where we might be missing the mark and taking the opportunity to learn in this experience is the topic for the third part of this trilogy.